Kingston Upon Thames is one of over thirty London Boroughs. It is also one of London's two Royal Boroughs, the Royal Borough of Kingston Upon Thames and the Royal Borough of Kensingston and Chelsea. Situated on the River Thames, Kingston is not far from Richmond, another London Borough on the Thames. 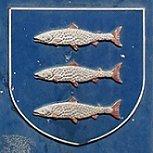 Kingston's official emblem, three salmon, dates back to the importance of salmon fisheries in Kingston many centuries ago. The Coronation Stone, now outside the Guildhall, was the seat of Saxon kings during coronation ceremonies. Edward the Elder was crowned in Kingston in 900, Athelstan in 925, Edmund in 940, Edred in 946, Edwy in 955, Edward the Martyr in 975 and Ethelred the Unready in 979. The Hogsmill River that joins the Thames at Kingston can be seen from the Coronation Stone. Clattern Bridge, which crosses the Hogsmill River, is one of the oldest bridges in Surrey and is a Scheduled Ancient Monument. The earliest known reference is in a deed from 1293; the medieval name of "Clateryn-brugge" is thought to be descriptive of the sound of horses crossing the bridge. The stone arches on the downstream side are the oldest parts of the bridge which until the mid nineteenth century was only eight feet wide. 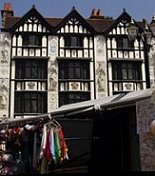 A stone's throw away from the ancient Clattern Bridge, Kingston's Market House towers above the market stalls. A statue of Queen Anne is perched on the upper storey of the building. 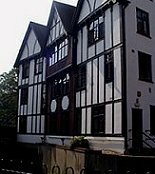 Various old houses can be seen around this area of Kingston, some dating back to the fifteenth century. There are a number of contemporary apartments and restaurants where the Hogsmill River meets the Thames. Kingston High Street is a busy shopping centre and the Bentalls Centre is a modern mall housing all the familiar chain stores.